Beach picture frame – Now that it’s officially fall, you probably have a few great pictures from your trips to the beach over the summer. A great way to display those pictures is by making your own beach picture frames. You might think it’s a daunting task, but it’s really simple and these picture frames make great gifts as well. Put down a sheet of old newspaper on your working space for easy clean up. Spread a layer of Elmer’s glue on the frame. You can use your fingers or a paint brush to do so. Quickly pour some sand on top of the glue. Lift the frame and gently shake off the excess sand from the frame on the newspaper. Then repeat this until there is enough sand covering your picture frame. 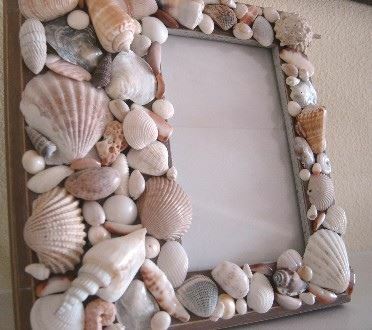 Use a hot glue gun to secure your favorite sea shells on to the sand portion of the picture frame. You can use as many sea shells as you would like. You just add a few or cover most of the picture frame. Adult supervision is needed when using a hot glue gun. Let the frame dry for about four hours to be on the safe side. Once the picture frame is complete add the photo and display in your home!